The ZXCT1009 is a high side Current Sense monitor. Using this device eliminates the need to disrupt the ground plane when sensing a load current. It takes a high side voltage developed across a current shunt resistor and translates it into a proportional output current. A user defined output resistor scales the output current into a ground-referenced voltage. The wide input voltage range of 20V down to as low as 2.5V make it suitable for a range of applications. A minimum operating current of just 4A, combined with its SOT23 package make it a unique solution for portable battery equipment. By Zetex Semiconductors plc. This is one package pinout of ZXCT1009T8,If you need more pinouts please download ZXCT1009T8's pdf datasheet. 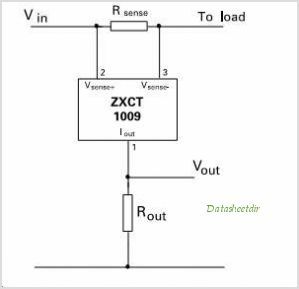 This is one application circuit of ZXCT1009T8,If you need more circuits,please download ZXCT1009T8's pdf datasheet.